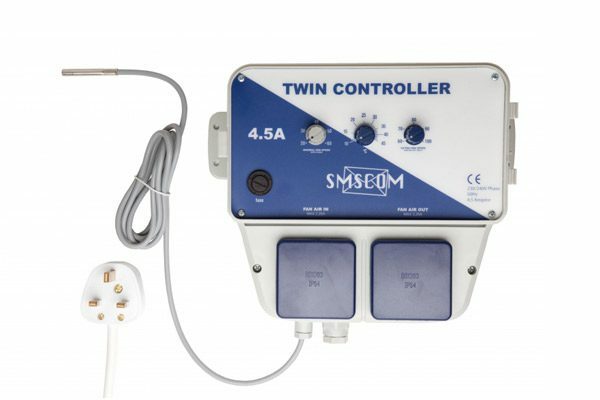 The SMSCOM Twin PRO Fan Controller 4.5A Mk2 works the same way as the Standard Twin Fan Controller but has an additional program in its software to remove excess humidity from the grow room during the lights-off cycle. When the lights switch off, the Twin Pro Controller will automatically switch to a second program that gently increases the fan speed every hour for just long enough to remove excess humidity from the grow room. When the lights come back on, the Twin Pro controller switches back to its main program. The grower can activate or deactivate this secondary program at any time. This controller represents a real step forward in automatic temperature control. Unlike other controllers that simply shunt fans from idle to full speed after the temperature is exceeded, the Twin Controller automatically calculates the exact running speed for your fans to maintain the temperature you set. This new method provides more accurate temperature control, limits fan noise and guarantees negative pressure inside the room. Simply plug in your fans set the temperature and the Pro Twin Controller will take care of the rest. *PLEASE NOTE: When running fans at a low speed, a slight buzzing noise may be heard. For completely silent fan operation, we recommend the SMSCOM Hybrid Fan Controllers or the new RHINO Silent Fan Controller range.